Photo credit: Twitter | @A_Vivancos and @RealDonaldTrump. US President Donald Trump congratulated Brazil’s new President, Mr Jair Bolsonaro and confirmed that the two have spoken at length, calling for a close cooperation on trade and military. The newly elected Brazilian President Mr Bolsonaro is an ardent admirer of Mr Trump and many political commentators on the left fear that the partnership could create one of the warmest bilateral relationships in the Western Hemisphere. 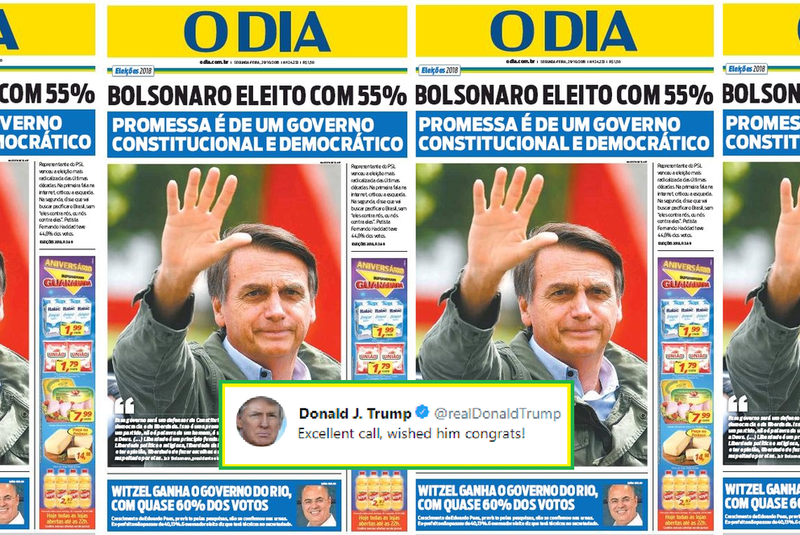 Related coverage: <a href="http://thegoldwater.com/news/40713-Bolsonaro-Becomes-Brazil-s-New-President"> Bolsonaro Becomes Brazil’s New President</a>. The White House confirmed the call, saying Presidents Bolsonaro and Trump spoke of “a strong commitment to work side-by-side” on all issues affecting Brazil, the United States and beyond. In newly elected President Mr Bolsonaro, US President Trump will also find someone ready to let go of the Paris Climate agreement, and this will allow the White House administration to convince critics that they are no longer alone in this issue. Furthermore, the possible alignment of the two largest nations on the American continent spells further bad news for leftist countries that have been a thorn in the eye of the US, most notably Venezuela (and Cuba to a lesser extent). Mr Bolsonaro has repeatedly slammed the dictatorship of Venezuelan President Nicolas Maduro. Mr Bolsonaro won the second round of the presidential vote with almost 56% against his left-wing rival Mr Fernando Haddad after he had also won the first round with 46%. Watch out liberals…the boogeyman is gonna stop us from getting ripped off by other countries. Oh no what are others gonna think? If they were allowed to!